“What matches hot pink ski pants?” my husband asks. My daughter insisted upon buying hot pink ski pants, but now she needs a ski jacket to match (or not – given the new style rules or lack thereof). It’s that time of year. Our family of skiers gets in shape, and preps our ski gear for winter. Each family member prioritizes and picks their one new item (necessity or nicety depending upon how much growth or wear and tear has occurred since last winter). For our son, its all about the hardware – shiny new ski gear. We have the opportunity to demo skis at Stratton each February and test next year’s gear. Then we find last year’s models on sale. Our daughter, however, is all about the ski outfit. The Proper Ski Outfit starts from the inside out. Nothing keeps you protected like technical fabric base layers tops and leggings, in fun festive colors. If its forecast for wicked cold, a layer with merino wool, moisture wicking is ideal for skiing to après ski. Ski socks are key, not cotton or nylon, but SmartWool Ski Sox that the U.S. Ski Team wears. Smith IO Goggles or Spy are the best ski goggles. The big lens provides super peripheral and snow definition from flat light to full sun, and they look coolwith their reflective crystal rose finish. A neck warmer is like Turtlefur made in Vermont or a Balaclavas for full face protection is importatant on windy sleety snowy days. Skida makes lighter weight stylish face protection from wind and cold, and sun – is also made in Vermont! If your hands get cold even in quality lather mittens, a pair of HotHands disposable hand warmers are a buck a day pack a day savior. Dress properly and be ready for any weather and family fun on skis! 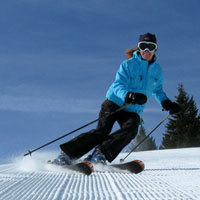 And don’t worry is your ski jacket doesn’t match your hot pink pants, just bring your best ski style and a smile. Se our guide on How to Pack for a Ski Trip!